There are two basic reasons for the increased interest in "text analytics" and "sentiment analysis": In the first place, there's more and more data available to analyze; and second, the basic techniques are pretty easy. This is not to deny the benefits of sophisticated statistical and text-processing methods. But algorithmic sophistication adds value to simple-minded baselines that are often pretty good to start with. In particular, simple "bag of words" techniques can be surprisingly effective. I'll illustrate this point with a simple Breakfast Experiment™. Pure golden color. Golden raisin, honeydew, balloon, and flint aromas. A brisk entry leads to an off-dry medium-to-full body of honeyed peach, golden raisin, and rubber eraser flavors. Finishes with a petrol-like mineral, tangy apricot marmalade, and spice fade with pithy fruit tannins. Hazy, pale golden color. Funky, old canned vegetable and lemon detergent aromas follow through to a bittersweet medium-bodied palate with wet hay, fruit stones, orange drink, and honey candy flavors. Finishes with a tannic citrus peel fade. The simple-minded "bag of words" approach to analyzing such material starts by counting how often each word is associated with a given score. There are 21 possible scores (or at least 21 scores that are actually used in my sample), and 7,303 distinct "lexical tokens" (including wordforms, marks of punctuation, number strings, etc. ), so this simple counting exercise gives us a matrix with 7,303 rows and 21 columns. Bright orangey-brick hue. Aromatically reserved, with a subdued, earthy undertone. A rich entry leads to a rounded, moderately full-bodied palate with a wave of aggressive tannins. Somewhat mean. Try with mid-term cellaring, but? The exclamation point, unsurprisingly, has a fairly high average score of 90.34. 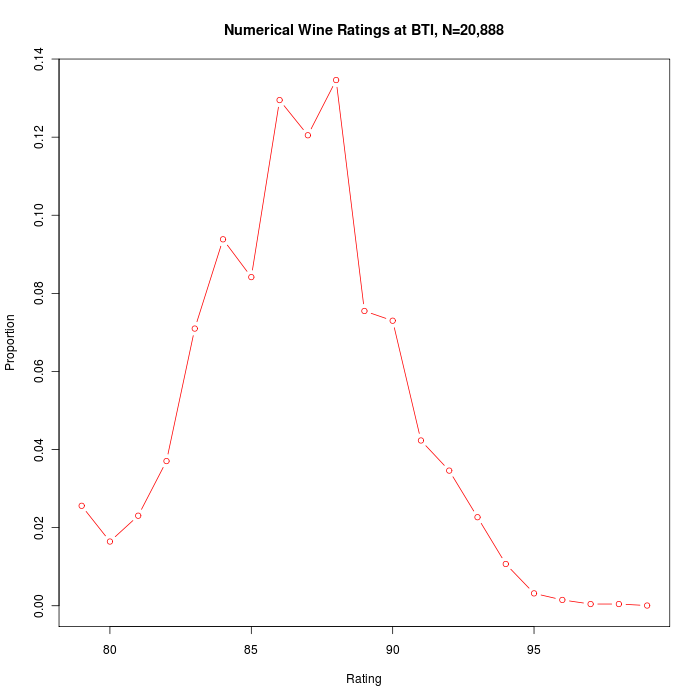 From the same data, we could calculate some other, equally simple tables of numbers, say the matrix of words by reviews, where the i,j cell holds the number of times that word i occurs in the text of wine-review j. Like the words-by-scores matrix, this words-by-reviews matrix also supports some really simple applications. For example, we can approximate the similarity of two wine-reviews by taking the "inner product" of the corresponding columns in the matrix — giving us the counts in one column multiplied by the counts in the other column, all added up. With a bit of weighting thrown in to take account of things how unevenly distributed words are across documents, this "cosine distance" has been a basic technique in document retrieval and text mining for decades. And again, this matrix of counts is the starting point for some slightly more sophisticated techniques. 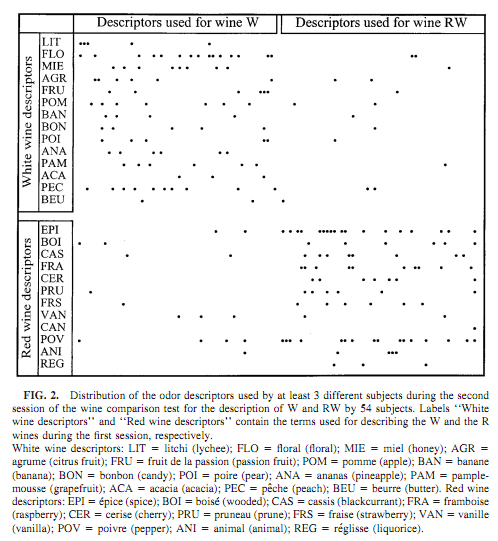 For example, we could use the association of words with wine-reviews to infer the overall contribution of each word to the vector of wine scores, either overall or for different kinds of grapes or in different price ranges, using various regression techniques. The technique known as "latent semantic analysis" starts with this same type of "term by document matrix" — a table whose rows are words and whose columns are documents, with the number in row i and column j representing the number of times that word i occurs in document j. A mathematically simple technique called singular value decomposition (SVD) gives us a way to find a low-dimensional approximation for any matrix, including specifically such term-by-document matrices. We can use this technique to approximate the information in a word's distribution across documents with a projection onto an arbitrarily short vector, 2 or 20 or 200 numbers rather than 20,000 (or 20 billion) . Obviously, the quality of the approximation improves with the number of numbers that we retain — but typically, the returns (in terms of, say, the effect on estimated distances) start to diminish rapidly. Furthermore, at least the first few of these numbers (ranked by importance) are often humanly interpretable. And this approach can be a worthwhile way to find interpretable dimensions even if we start with a much smaller space. On beyond averaging, regression, and eigenanalysis, there are many more elaborate and more sophisticated sorts of analysis we could (and should) do with datasets like this — but again, a simple-minded baseline starts us off in a pretty good place. Of course, the way the words are put together in text really does matter. A text is more than a "bag of words". All the same, simple word-choice carries enough information to start us at a useful level for many tasks. And there are almost-equally-simple methods that take account of the sequence and structures of words in texts. But that's a topic for another breakfast. Has this kind of analysis been done with opinion / analysis articles about current events? I'd be interested in how terms cluster, and whether the clusters correspond to political ideologies. My own mental map of the world is that on any controversial issue, be it the Vietnam War, the Civil Rights movement, Israel/Palestine, opinions tend to cluster into two poles (right vs left), with an unstable grouping ("well-meaning liberals") who try to split the difference. I can usually quickly classify articles on this basis. My intuition tells me that these three groupings use different words. Another issue is: do these clusters exist from the very beginning? Or is there a process of polarization that goes on? Please tell me that those quotations, at least the first two, are parodies. "flint aromas"? "rubber eraser flavors"? "wet hay, fruit stones, orange drink"? Seriously? I don't understand the first thing about this analysis, but if Mark Liberman is a wine connoisseur he might subscribe to my son's newsletter, View from the Cellar, where he would I think find further wine descriptors. And in answer to commenter #1, yes, that sort of verbiage does appear in wine reviews. Whenever I happen to read them I don't understand them either. For ancient me a wine either tastes good or it doesn't. What? Wine and song, but not women? I'm curious what the, um, "inter-annotator agreement" looks like for wine tasting. Do these words actually even have consistent meanings? In the figure, "wine W" is white wine, while "wine RW" is white wine dyed red. The singular–plural difference seems rather slight, but if it's a real effect (or, for that matter, even if it isn't), the direction makes intuitive sense to me: plurals, especially for all those fruits, sound more real and more complex. "Blueberries," for instance, calls to mind all the variation in flavour that one would find in an actual pint of fresh blueberries, but "blueberry" sounds more like a single note. Or, to put it another way, fruit sounds tastier if it hasn't been put through Pelletier's Universal Grinder. Of course, it's easy to come up with that kind of story post hoc (or post hock). But it might be fun to ask people to rate the expected tastiness (or complexity, or price) of wines based on descriptions with singular vs. plural fruits, with everything else nicely controlled for. I'm surprised by the high scores of words like "detergent", "shrill" and "cardboard". It seems to me that having a scale that starts at 0 is pointless if even 'bad' wines score in the 80es. So, a wine that smelled or tasted *slightly* of detergent could well be on the border between so-so and pretty bad, as an average score of 80.3 would indicate. Keep in mind that there are very few truly bad wines in the market because no-one would buy them, given that you can get so-so wines like "Two buck Chuck" for only a few dollars a bottle. This port is a study in contrasts. It opens fast, round and sweet-pixie stick, buttercup, whispers of Diet Rite. The finish, though, is a battle of green pennies and bug repellent, with lead paint darting around the edges. Fairly sulfury throughout. I don't understand the "but?" thing. What does that usage convey? The two examples presented in the OP are pretty much "bags of words" IMHO. I used to edit a wine columnist, and at one point I saw a list of the flavors one is apparently allowed to perceive in wine. ("Peach" vs. "white peach"? I fold.) The most vivid official aroma was "cat urine." @Lazar: I've never seen "but?" like that before, but I take it to mean "but this is questionable, so don't count on anything."